The partners have claimed poor pay conditions have forced families to go to dangerous money lenders. 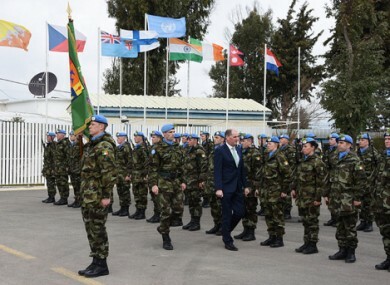 Junior Minister for Defence Paul Kehoe spends St Patrick's Day with troops on the Golan Heights. THE WIVES AND partners of Defence Forces members are organising a national protest to be held outside every barracks and army base today. The protest is to highlight what the group describes as “the terrible pay and conditions that our loved ones have to endure on a daily basis”. The protesters claim that the force is the only sector of public service as a whole that do not have access to the Workplace Relations Commission and the Labour Court. A spokeswoman for the group said: “Over 20% of Defence Forces enlisted personnel are in receipt of Family Income Support (FIS). No person who volunteers to serve their country should be allowed to have wages so poor that they need social welfare support. “Families are losing homes due to repossession. Many members have missed payments on bills as a result of cuts so cannot access loans so money lenders are a reality. Email “Wives and partners of Defence Forces members to hold nationwide protest today ”. Feedback on “Wives and partners of Defence Forces members to hold nationwide protest today ”.